Life is good. I was sick when I left Colorado, but for some reason being sick in Hawaii does not feel as bad as being sick in Colorado; I think it’s because of the humidity. My friends greeted me with a lei and champagne at the airport, not too shabby! I have a few interviews at restaurants around the area this week, one of which is Morimoto’s restaurant in Waikiki! Wish me luck! Since I am having so much fun, I figured you all deserve some fun as well, so I am happy to announce a cheese giveaway from Ile de France cheese! This giveaway is extra exciting because there is not one, but FIVE winners! As much as I try not to, I always want to use buffalo sauce when I have bleu cheese… Only natural. This time I wanted to be a little unique so I turned the buffalo and bleu cheese combination into a tasty tartlet, the perfect appetizer. This dish is definitely for people who truly love the taste of bleu cheese. As for the giveaway, see below on the rules and how to enter! Cut the tart crust into small pieces and roll out individual tartlet shells. Place the shells in a well-greased min cupcake tray, fill with baking weights and bake until crisp (about 30-45 minutes). Meanwhile, toss the chicken and onion with the buffalo sauce in a bowl. 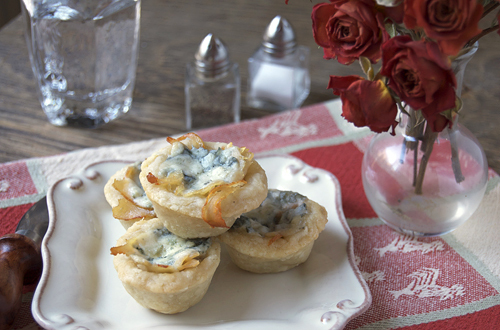 Remove the tartlets from the oven and fill with the chicken mixture, then top with bleu cheese. Return the tartlet to the oven and bake until cheese is melted (about 10 minutes). 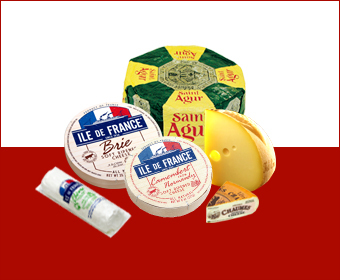 For the giveaway, Ile de France will be providing FIVE lucky winners with an assorted cheese gift! I will pick a winner in TWO weeks on January 23rd. Since there are five prizes, I want to structure this giveaway a little differently. Tell me why you would love to have some of this tasty cheese and what you would make! Become a fan on Facebook (include your Facebook name that you are using). Tweet about this giveaway (use @savourthesenses in the tweet). Get your friends to enter (Leave a comment telling me each friend who you referred, I will check for validation). Get your friends to like my Facebook (Leave a comment telling me each friend who you referred, I will check for validation). Get your friends to follow me on stumble upon (Leave a comment telling me each friend who you referred, I will check for validation). One winner will be personally chosen by me based off what they want to make! Disclaimer: I was compensated with product by Ile de France for this post. Best of luck on your interviews. I LOVE cheese. I usually keep about 3 or 4 different varieties in my refrigerator at one time. If I won this fabulous cheese, I would make grilled cheese sandwiches, quiche and I’m sure some casseroles. The possibilities are endless. I already follow you on Twitter @GoddessFoodie. Those tarts look delicious. I’d have loved to have grabbed a handful on New Year’s Eve. I hope that your cold is entirely gone very quickly so you can fully enjoy Hawaii! Fingers crossed on the interview as well. You’re on hallowed ground there in Morimoto’s restaurant. I’m very envious. Commented on the Spiced Sweet Potato Chips. I love cheese. I’d just eat it all with a baguette or crackers! I love all cheese, (except goat cheese.) I eat cheese on everything. Craving some cheese and wine now! These tartlets look like the perfect treat to go with a glass of wine. I’d love to have some cheese because I am a Wisconsin girl and we love our cheese! I would make buffalo chicken dip with it! Oh these are so cute and sounds delish! I want some of this cheese to use in sauces, on pizza… in salads… I just plain love cheese, lol. Best of luck on the interviews! I’ve been wanting to make some blue cheese grilled burgers for my mom and dad (their absolute FAVORITE things!) and this would be perfect! Not to mention, it’s grilling weather here in Ohio! Jenny, I have enjoyed your blog and Keeping track of your progress. My kids have turned into quite the little foodies. I would use the cheese (Brie and goat cheese) for the new favorite school lunch…A sandwich of proscuitto, fig jam and good cheese! We love cheese in this house!!!! Cheese finds its way into lots of things that I make! I have a recipe for goat cheese tarts that I might make if I won… I would be excited to try the Brie as well.. haven’t tried it! 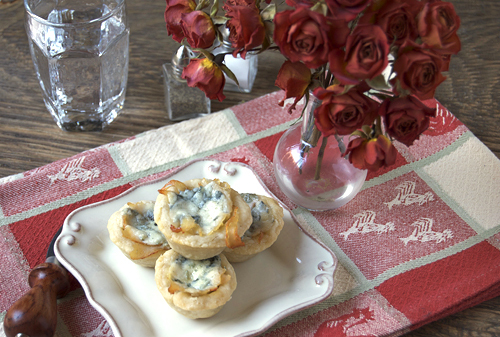 Delete my previous comment – I love cheese and if I win – I make make some of those fabulous tarts. What would I make? – we love cheese! An evening of tapas with assorted cheeses and the kids at Nana’s yes please! Maybe a homemade spinach pizza topped with a little moz & goats cheese – o ya.. I would make a lovely cheese plate, and then invite some friends over for a game night!